I am new to mixed media and art journaling so be kind. Here is my first page in my new art journal. I kinda winged it with the only pre-requisite being the colours required for the new Mixed Media Colour Challenge. and an idea that I might satisfy another challenge by adding hexagons but I love them so much I’d probably have used them anyway! ETA: I just noticed how grey the top right textured area looks. I PROMISE, it isn’t like that IRL. Somehow, between adding the gold paste and adjusting the levels to make the other colours look right it does that. I don’t know why. Sorry! It is more accurate in the close up below though brighter white IRL . I had so many ideas that didn’t work out. Gotta love that gesso. It’s like an eraser or a Copic blender pen for art journals! I orignally had a yellow BG with peach bubble wrap over it and then added the texture paste ‘doily’ over it. Which was good because I didn’t love the bubble wrap look too much. Then I tried adding the hexagon stencil with coral spray mist. Ugh! The spray mist was too intense and looked like my page was bleeding. Plus, it soaked right into my texture paste so there was no wiping it off. So I started fresh with new gesso and a new coat of yellow paint. Ahh, that’s better! But now I was really missing the white of the texture paste so I reapplied it in the opposite corner. I had also added some pink on it with my Copic airbrush system so I added that back also. To make the original texture stand out, I added some gilder’s paste. This is the new area of texture paste. It was brighter white but I added a tiny bit of gilder’s paste. You have to be careful with that stuff. Lots looks shiny and pretty. A touch can look nice or it can look dirty. I wish I’d used a bit less; maybe only on the outer parts? This butterfly was traced from a Studio Calico mask. I was going to layer the lighter butterfly on top but when I realized you wouldn’t see any of the mist on it, I decided to place them separately. I hand cut the blush butterfly. The next mask size down is a lot smaller. I don’t know why there is such a jump in sizes as the next 4 are closer in size to each other. It’s a LOT easier to size up by tracing around a mask than to try and size down!! So in the end, here are my layers. Gesso, acrylic paint, dictionary page, texture paste, spray mist, gesso, acrylic paint, Copic airbrushing, embellishments, Gilder’s paste. I’m entering this in Crazy for Challenges C4C192 to use Hexagons. Also Really Reasonable Ribbon #75 challenge to create anything but a card with ribbon. 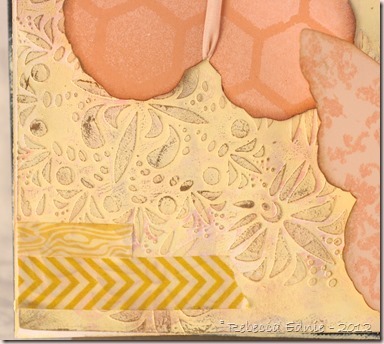 And last but not least A Mixed Media Colour Challenge to use yellow, peach and pink. Click graphic to visit the post. ETA: I completely forgot, I meant to also enter this in the Simon Says Stamp and Show Blog. Anything Goes. Great journal pages! Thanks so much for participating in our Really Reasonable Ribbon Challenge. 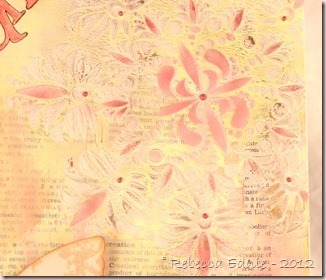 Rebecca – YES, gesso is your friend! I LOVE that stuff, too! Your brand new journal has BEAUTIFUL pages to start it off! 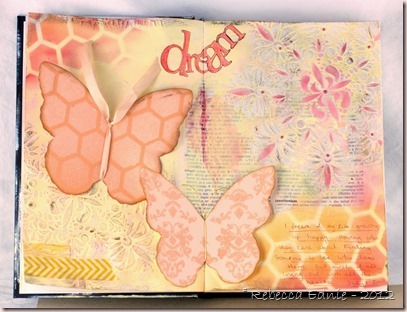 LOVE your staggered butterflies and the dictionary page and mist and texture! FABULOUS! 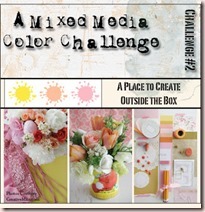 THX for playng with us at A Mixed Media Color Challenge! Stunning pages!!! I LOVED reading your process because that's the way my mixed medias come together too!!! 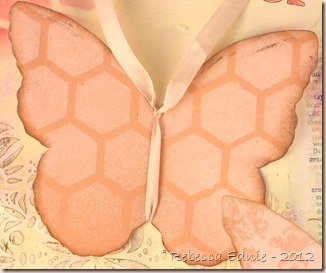 LOVE the gorgeous hexagon pattern on your butterfly! Beautiful!!! 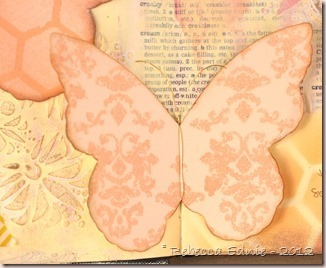 This is gorgeous, Rebecca…I love the background you created and the butterflies are really pretty!!! Rebecca your journal pages are beautiful! Surely the first of many more! Your butterflies look wonderful and I love the misted / textured background! Thanks so much for joining along with A Mixed Media Color Challenge!